Designed like a sofa, the Crypton Sleeper Bed made by Jax and Bones is ultra durable and attractive. Bolstered side unzip for easy cleaning and are overstuffed with hypo-allergenic recycled fiber for comfortable support. Styled for dogs that love to lean and snuggle. The tufted inner pillow removes easily to machine wash and dry. Crypton Fabric is stain and spill resistant. Plus,the bed cover is removable and washble. The perfect solution for dogs that drool or have accidents. Crypton material uses anti-bacterial technology that stays clean and doesn't smell. It also repels water so it's great for swimmers, puppies and older dogs. Crypton's environmentally friendly fabric helps prevent allergens and skin issues in dogs. Crypton fabric comes with a 5 year protection guarantee (but not against chewing). Each bed is filled with Sustainafill, an allergy-free eco-friendly fiber filling. Beds have removable and machine washable covers. Small stains can be wiped easily away or wash covers when needed. Machine wash cover and tufted pillow in cold water. Line dry or tumble dry low. Do not bleach. Do not wash inserts. Do not wash tufted pillow in washer with agitator. 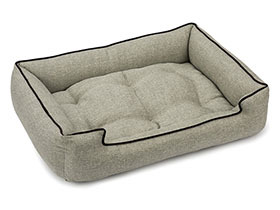 Each Jax & Bones bed is made to order in California and is not returnable. Allow 7-10 days for shipment.